Creative announced an exciting new range of high-fidelity speaker systems with the Creative X-Fi Sound System Z600, Creative PlayDock Z500 and the Creative TravelSound ZEN V docking speakers. Offering the best in innovative design and high quality audio performance, they bring listening experience to greater heights and music closer to users. The stylish Creative X-Fi Sound System Z600 is integrated with the award-winning X-Fi technology that dramatically improves users' listening experience by bringing MP3 music to the X-Fi Xtreme Fidelity standard. The compact design of the Creative PlayDock Z500 and Creative TravelSound ZEN V docking speakers makes them conducive for travel or any outdoor activities. Family and friends can enjoy music and videos together either during vacations or in the comfort of a home setting. The Creative X-Fi Sound System Z600 allows users to dock, charge and playback music content in their Creative ZEN Vision: M player simultaneously. As the first sound system to be powered by Creative's exceptional X-Fi audio processor, it enables users to playback their MP3 music to beyond CD quality and experience stereo in virtual surround sound. The award-winning X-Fi audio technology is integrated in the speaker system, featuring the X-Fi 24-bit Crystalizer to intelligently help restore the details and vibrancy lost during the compression of downloaded music and movies. With X-Fi CMSS-3D technology, users can also enjoy immersive surround sound over speakers and headphones. The two wall-mountable satellite speakers and a compact subwoofer with a large 8" long throw driver fill the room with dynamic bass and crystal clear sound. A comprehensive infra-red (IR) remote control allows users to navigate the key player functions for the Creative ZEN Vision:M and speaker functions for the Creative X-Fi Sound System Z600. It is the most sophisticated Creative ZEN Vision:M X-Fi System available for use around the home, be it in the living room or bedroom, whether connected to your PC or notebook. 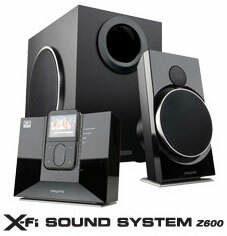 The Creative X-Fi Sound System Z600 is incredibly versatile, supporting an extensive array of consumer devices including TVs, DVD and CD players. Through an audio/video out, users can now pipe their media content stored on their MP3 player to any external TV. In addition, by combining this speaker system with the award-winning Creative ZEN Vision:M player, the results are simply astounding as movies and music have never sounded better. 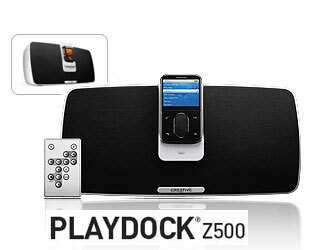 Creative also introduced the stylish Creative PlayDock Z500 portable speaker system for portable media players. With a high-gloss finish and contoured design, this powerful sound solution definitely has the looks and audio prowess to become the centre of attention for any occasion. The Creative PlayDock Z500 is designed as a docking speaker for the Creative ZEN Vision:M and Creative ZEN V/ZEN V Plus players. Users can charge the player while listening to music or ZENcasts. The speaker system uses high-performance drivers to create a balanced listening experience and accurate reproduction of music. Its Creative Wide Stereo Effect feature produces superior stereo sound imaging, thus creating a big soundstage. In addition, it comes with a built-in subwoofer with bass control for superior accurate bass response. Being magnetically shielded, the Creative PlayDock Z500 can be placed near any TV or computer monitor without causing any interference. The digital amplifier allows the speaker system to be more efficient and have a longer battery life. Being dual-powered, users can have the option of using either eight C-size batteries which allow 16 hours of continuous music playback on the go, or the bundled universal power adapter depending on their preference. This durable speaker system even has a built-in handle for convenient transportation as well as a built-in telescopic antenna to obtain clear FM reception when paired with the Creative ZEN Vision:M or Creative ZEN V Plus players. With the included wireless IR Remote, users can control the Creative PlayDock Z500 and MP3 player remotely. Photos and videos stored on the Creative ZEN Vision:M can also be shared and viewed on the big screen using the audio/video out connection for audio and video files. Creative introduced the Creative TravelSound ZEN V as a portable high-fidelity docking speaker that is designed exclusively for the Creative ZEN V and Creative ZEN V Plus players. It allows users to listen to their music and charge their players at the same time. Data and music files can also be transferred to the player while the player is docked on the speaker. Four full-range NeoTitanium microdrivers deliver smooth audio clarity and pristine quality sound. The Creative Wide Stereo Effect feature enables this small speaker system to produce a wider sound field giving users a greater sense of immersion and spaciousness. 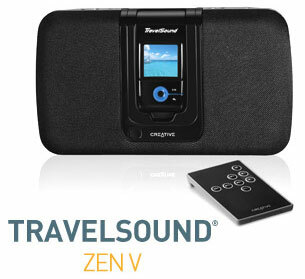 The Creative TravelSound ZEN V enables the user to play music continuously anywhere, never missing a beat. It can be powered with either four AA batteries which allow up to 25 hours of extended music playback, or with the bundled universal power adapter.